It’s funny what you find where. For over a week now I’ve been sharing my bathroom with this creature. Despite the urban legend that it has the “deadliest bite of all the spiders” (wrong on more than one account because this isn’t even a spider–a spider has a two segmented body This has one. We’ll stop there), this is a harmless insect (to humans). In the summer, I wonder the same thing. This is a really large bug. It’s so big, one of its legs didn’t completely fit in the photo. What is it doing on the second floor of my house? Doubtful it chose to climb up the side and sneak in a window–they haven’t been open much lately in the heat. It’s possible it “rode in” on something–me, the Spoiler or one of the dogs and then just found its way to the bathroom. I find insects love bathrooms and the kitchen for the readily available source of moisture. Normally I’d try to take misplaced creatures back outside but these guys are delicate and this one is so big I don’t know what I’d use to relocate it–a small box? Besides, I did have that kitchen spider that lived for 6 months. From what I’ve read, these guys are fairly omnivorous and will eat almost anything that comes by, including bird poop. There shouldn’t be any of that in the bathroom but there should be enough other stuff to sustain it. The biggest problem is that it moves around quite a lot. 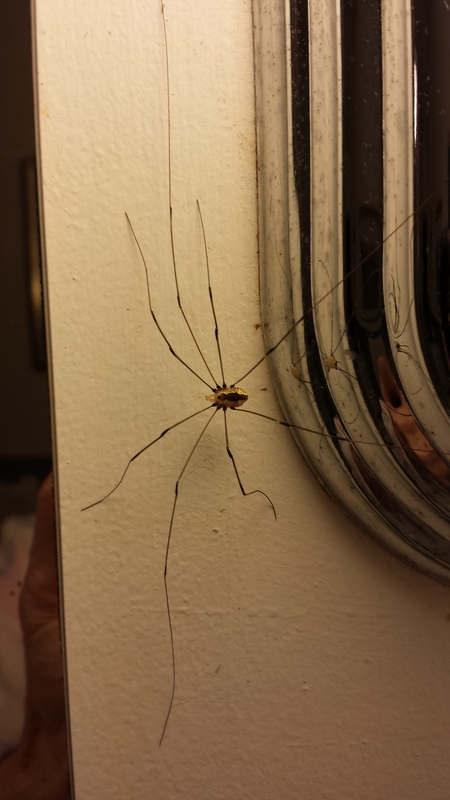 Unlike the kitchen spider, every time I come into the bathroom, it’s in another place. And until I locate it, I’m always a little wary. I don’t want to accidentally grab it–or find it’s on my hairbrush–or soap, as it was one morning. It was quite accommodating when I told it I needed to use that that and it needed to move. It’s actually more accommodating than the dogs sometimes. And it has great markings. Perhaps I’m growing a little too fond of it!